What he uncovers is more then just sewage--deaths that were deemed either natural or accidental were probably murder--but how in the world is he going to figure out who is doing all this--he suspects there are a lot of high ranking officials involved--can he devise a plan to catch them? Can he save that lovely old woman from being forced from her home? This is a fast reading book with lots of twists and turns-as are the other books in this series. I really think you will enjoy them as much as I do! 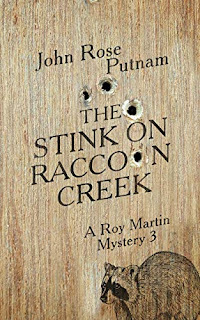 In book three of his Roy Martin Mysteries, bestselling author John Rose Putnam takes on a very troubling problem and comes out smelling like a rose. 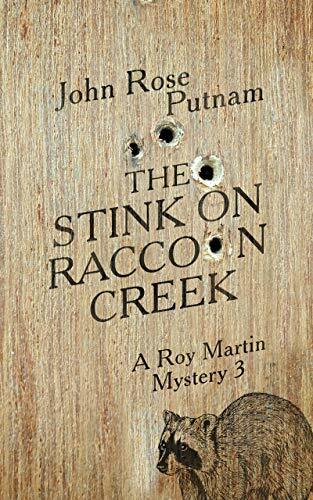 Summer doldrums and a severe heat wave combine to cause a slump in business for the Laurel County Sheriff, leaving Roy Martin free to investigate the complaint of a terrible odor along the remote and once idyllic Raccoon Creek. What Roy finds there is a sinister conspiracy to force Ernestine Walden, a charming elderly woman, to leave her lifelong home so that they can develop the land along the stream for a handsome profit. The plotters have already shown a ruthless determination to get what they want, including at least one cold-blooded murder. John came west as a young man and settled in Berkeley where he graduated from the University of California. He still lives and writes there and often gives a talk on the California gold rush to the gang at the Freight and Salvage. He spent a lot of time digging into that gold rush too and many of his stories take place back then. John's characters are so real they'll jump right off the page and talk to you; his villains have hearts as cold as midnight and his heroes almost always do the right thing in the end. He's working up quite a reputation for his knowledge of that era too. His blog, My Gold Rush Tales, attracted the interest of some TV folks and he appeared in a segment for the Travel Channel about Henry Meiggs, the man who built San Francisco's famous Fisherman's Wharf. 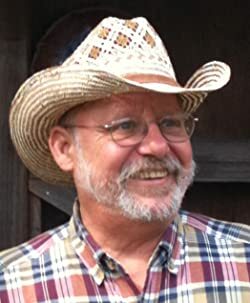 While his first novel, Hangtown Creek, a story of adventure, romance, and coming of age in the early days of the gold rush, was published in 2011, his brand new book, Into the Face of the Devil, moves between Hangtown and the sawmill where James Marshall first found gold, and pits a young man in love for the first time against a killer so evil he could pass for Satan.